The Word of the Week comes from the Grass-Mud Horse Lexicon, a glossary of terms created by Chinese netizens and encountered in online political discussions. These are the words of China’s online “resistance discourse,” used to mock and subvert the official language around censorship and political correctness. November 25, the day in 1950 when Mao Zedong’s son Mao Anying was killed in the Korean War. 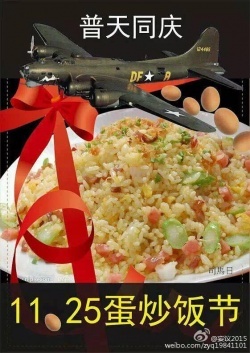 Netizens eat and share photos of egg fried rice on this day—also known as Egg Fried Rice Day (Dàn Chǎofànjié 蛋炒饭节)—to celebrate the younger Mao’s passing, as they believe he would otherwise have reigned over China with the same brutality as his father. Legend has it that Mao Anying did himself in by making egg fried rice during the day at his encampment in Korea. The sight of smoke drew an American fighter plane, which napalmed his hideout. Can’t get enough of subversive Chinese netspeak? Check out our latest ebook, “Decoding the Chinese Internet: A Glossary of Political Slang.” Includes dozens of new terms and classic catchphrases, presented in a new, image-rich format. Available for pay-what-you-want (including nothing). All proceeds support CDT.